Welcome to Mr. Suave's Mod Mod World, which this week is coming to you from my sick bed where I am fighting off one of those nasty winter colds. 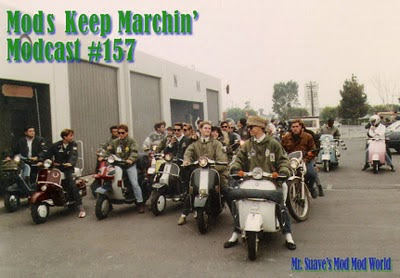 Don't worry though, you won't get anything from listening to this modcast ... other than another great selection of mod songs. Lots of new stuff here for you to groove on. The Modesty are a Swedish mod trio that have a new EP out, Take Modern I, which really rocks. The band mixes sixties and revival flavored power pop with some soulful garage overtones, and a bit of a modern Britpop flare for good measure. So, that alone should make you want to download this podcast and check it out. Go ahead, you won't be sorry.